Loop game is also known with many different names e.g. "Loop the Loop", "Fences" or "Slitherlinks". This is very famous logical puzzle. Now you can solve this puzzle online. 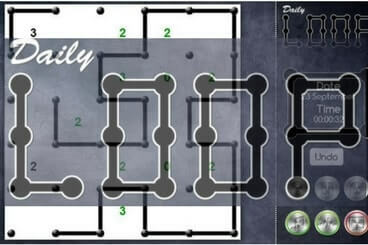 This Daily Loop games gives you option to play different games daily. You can also choose the size you want to play for this game. Draw lines between the dots to form a single loop without crossings or branches. The numbers indicates how many lines surround it.